Nowadays, when it is possible to have instantaneous discussion with someone at the end of the planet, nowadays, when you are seen as an Australopithecus if you do not have any mobile, nowadays when SMS, emails, phone calls are unlimited, it is difficult to imagine the isolation that Hirta’s inhabitants have been living for centuries. During the XIXth century, contacts with the continent are more and more frequent thanks to voluntary traffic of steamboats transporting some wealthy tourists looking for exoticism. Until this period, islanders only know one way to warn the continent in case of serious crisis (starvation, epidemic…). A summary and largely uncertain method. They have to build a fire on top of Conachair cliffs and then, they hope that a boat would see it…. Only from 1877, an evolution of means of communication appears. At this time, the Scottish journalist John Sands stays on Hirta through contact with the community. During his presence on the archipelago, an Austrian ship the little Dubrovacki, shipwrecks and nine sailors find refuge on Hirta. 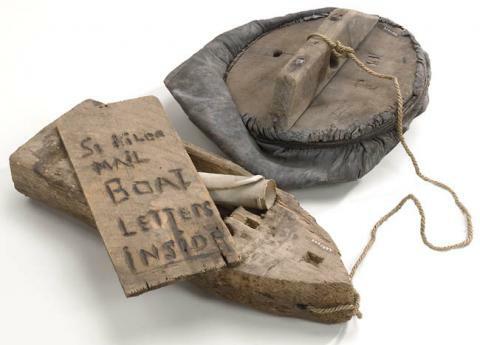 In order to allow them to go back home, Sands invents what we call the St Kilda mailboat. The principle is simple. He fastens a message to a buoy saved from the shipwreck and throws it into the sea. The waiting starts and nine days later, the message is recovered in Birsay, in the Orkneys, North of Scotland. Then, an expedition allows the shipwrecked sailors to return to the continent. Then, the islanders keep this idea replacing the buoy with a boat-shaped piece of wood. All this is linked with a sheep skin bladder in which a message in a bottle is carefully locked. About two third of the messages of this mailboat are thus recovered on Scottish shores with north western winds. Some of them are even found until Norway… However, it is a not very reliable method which could take a very long time! Back on the continent, Sands reports the danger of such an isolation which could be fatal in crisis periods. He succeeded in organising then, a quite regular connection service between Hirta and the Scottish shores, allowing the community to be re-supplied with food and material. 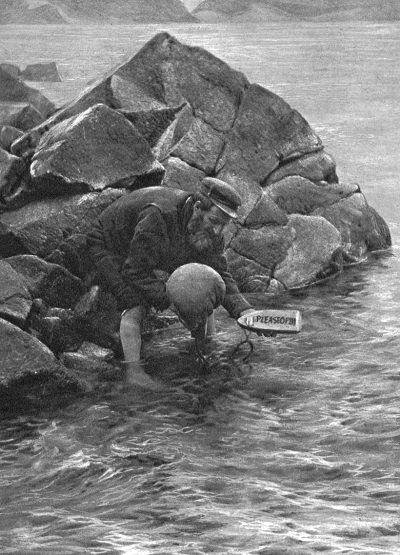 An islander launches the St Kilda mailboat, photo by Cherry Kearton, end of XIXth c.
Those means of communication with the continent stay precarious in a world where telegraph, wireless or telephones are being developed. In January 1930, Mary Gillies, a teenager is suffering from appendicitis. The inhabitants send a desperate message by way of the mailboat, asking for a doctor in emergency. Alas, when he arrives, he learns that the young girl is dead…. since several weeks! This tragic event deeply affects the community who asks for its evacuation. The price for isolation is too high to pay, and so the departure is bound to happen. Clément B., translation by Valérie G.
Tags: St Kilda, St Kilda history, St Kilda mailboat. Bookmarquez ce permalien.